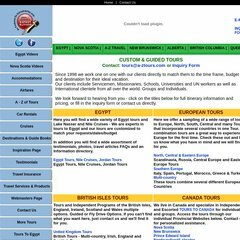 Topics: Egypt Videos, Nova Scotia Videos, Accommodations, Airfares, and Car Rentals. Age: The domain is 18 years and 0 months old. The estimated 73 daily visitors, each view 1 page on average. sharmelsheik.com Experts on trip plans to Sharm El Sheikh a top resort and dive destination .. It is hosted by Internetnamesforbusiness.com Florida, using Apache web server. Its 3 nameservers are ns3.meganameservers.com, ns1.meganameservers.com, and ns2.meganameservers.com. Its IP Number is 216.251.43.11. PING www. (216.251.43.11) 56(84) bytes of data.